If you have a fence around your property it is because you feel the need to keep strangers—either human or animal—out of it. Or perhaps you love to see your children playing carefree and, at the same time, you want to prevent them from walking into the street. Come what may, you want to ensure your property. The gate lock is the key piece in your fence system. A reliable, secure locking system will allow you to control who comes in or goes out. Locks are also a good deterrent against thieves, who usually look for an easy job. Since there are many different types of locks at your disposal to meet your unique circumstances, at times it might seem difficult, even overwhelming, to make a decision about which gate lock to install. But you don’t need to do that on your own. At Locksmith San Diego we will help you with that. Ranging from a simple latch on the inside, which will make sure that each time you use it the gate closes, to a maximum security electric gate lock, encompassing lockable latches, that need a key to open them from the outside but can be easily open from the inside, and ornamental locks that are easy to operate from both inside and outside, we will provide you with both practical advice and materials, depending on whether you want a simple mechanism or if you feel the need to have something thief-proofed. Sliding Bolts and Latches. These provide basic security for your fence. They are used to make sure the gate is not left open. You can chose a spring-latch to make sure the door closes every time you use it. A sliding bolt will add more security making the latch accesible only from the inside. 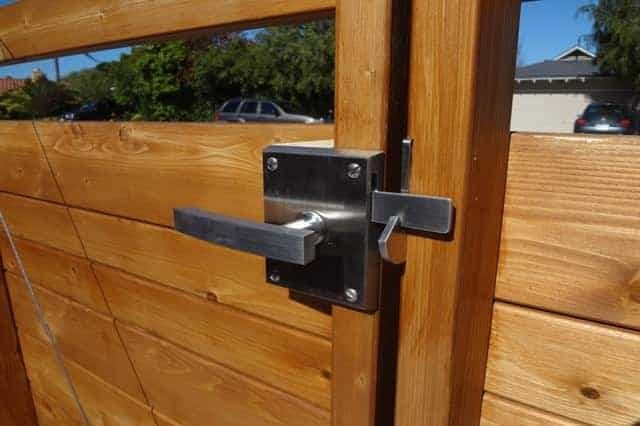 The thumb-latch is a more decorative gate lock it can be operated easily from both inside and out. Lockable Latches. With these, the gate can be opened with ease like a customary latch from the inside but from the outside they need a key to open the gate. We can provide you keyless lockable latches too. They come with a keypad to introduce your security code and a handle to open the gate. Are you not good in remembering codes? You can have it also with a Key Override system. On the other hand, if you are one of those who walk back to the gate to make sure that you have closed the gate properly, you can choose a lock with a deadbolt instead of a spring-latch. You can also have it single or double sided, to be accessed from either inside, outside or both. Electric Gate Locks. In this category, some use a mechanical system to lock the gate, whether a deadbolt or a spring-latch while others use an electromechanical system, that is, an electromagnet that restricts the gate from opening. These can also be operated from a distance, from inside your house or your car. As we said earlier, choosing just the right lock for your fence gate from among all the different possibilities could seem an overwhelming task, but don’t you worry, we are here for you! Avoid hooks. Some fence locking systems consist of just a hook that hooks onto the latch. This may seem enough but you would be surprised at the amount of times that people leave without properly locking the fence, thus giving their pet an opportunity to get out, wander about, and get itself, or even the pet’s owner, in trouble. Therefore a spring latch system is always better, since it will make sure that the door closes even if you leave in a rush. Locks with a double key system. You don’t want the burglar to jump over your fence and then have an easy way out because he/she just needs to push a handle to open the gate door. 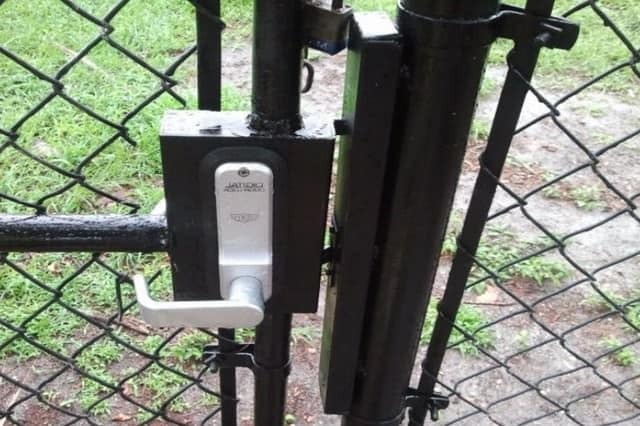 With a double key lock, they will need the key to open the gate even from the inside. Combination locks. These are keyless locks that will work from either side of a wooden fence. They can endure extreme weather. Forget about loosing keys or finding that your lock is rusted or frozen. You will only have to set your desired combination and you will be able to operate it comfortably with just one hand. On top of that, some add a lock-box feature. We are one of the largest companies in the area and provide a 24/7 service to the whole of San Diego, CA. We are driven by honest and strong values, and our aim is to give you the best service. You can visit us in any of our 67 different locations or call us to ask for information or request our services. 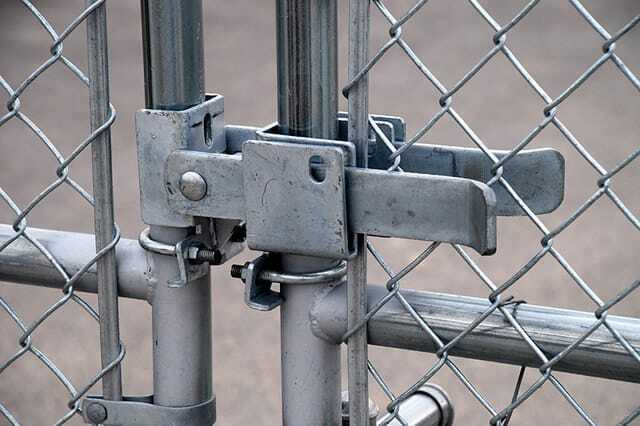 Allow our years of expertise in the security field guide you through the process of choosing the right fence gate lock for you and let our technicians mount it for you. We will let you focus on your daily activities, on your business, or on resting, while we get your gates sorted. Remember that, even if you are not really bothered about turning your lawn into Fort Knox, installing gate locks is a good way to protect the ones you love and make it more difficult for burglars to enter into your lawn where they will have the privacy they want.